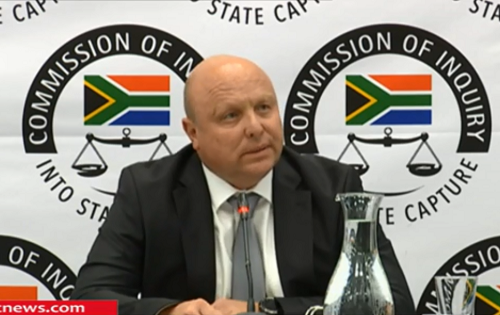 Former facilities management company Bosasa CFO Andries van Tonder gave the Zondo commission on Wednesday details of how the controversial company which would be used to bribe officials. Van Tonder said the company’s CEO, Gavin Watson, on a monthly basis requested substantial amounts of cash, varying amounts, which escalated over the years, which would be used for bribing officials. Van Tonder said “initially, the cash was generated by means of drawing the cash from” the company’s bank account through a cash cheque issued by the company’s accounts department. Cash requisitions accompanied by “fake invoices” were made to the accounts department, Van Tonder said. This method, however, became problematic when Watson’s monthly requests escalated, Van Tonder said. The fake invoices included payments to non-existing labour brokers who would state that their staffers wanted to be paid in cash, Van Tonder said. One of the schemes for generating the money for bribes included purchasing fuel from Belfast Toyota which Bosasa did not receive. Belfast Toyota would invoice Bosasa and cash would be transported to the company on a daily basis “but there was never fuel received”, Van Tonder said. The former CFO said from time to time there was an instruction to utilise wholesalers by invoicing for goods not delivered to Bosasa in order to generate the bribe money. Van Tonder said one of the largest methods for generating the bribe money was done through a company called Equal Trade Pty Ltd, owned by Gregg Lacon-Allan. Between R4m and R6m was collected on a monthly basis from Equal Trade, Van Tonder said. He said on a weekly basis he would receive a WhatsApp message from Lacon-Allan on Mondays requesting order requirements for the week. These order requirements included tonnes of chicken which were never delivered to Bosasa. One message submitted as evidence at the commission dated March 13 2017 was a request for one tonne of chicken which was apparently a code – one tonne of chicken equalled R1 million, Van Tonder said. The code was used because after Bosasa paid Equal Trade, money would then be delivered by Equal Trading to Bosasa, which would be used for bribes. Van Tonder said once he had collected the cash near a shopping centre near Lanseria Airport, he would take it to the Bosasa head offices and lock it in a safe in a walk-in vault at the company’s secretary’s office. Van Tonder testified that the orders to justify the payments to Equal Trade were not genuine. The CFO said an order sheet – apparently for providing food to the company’s various kitchens – was prepared by the accounts office so that Lacon-Allen could invoice Bosasa. Bosasa ran kitchens in mines, youth centres, Lindela Repatriation Centre, and for prisons across the country. A fake invoice would later be created, Van Tonder said. The order sheet and proof of payment would be sent to Equal Trade from a separate Gmail address – johnforest@gmail.com – and an arrangement for the delivery of cash would be made one or two days later. About a week later, this would be followed by the fake invoices Equal Trade would send to Bosasa based on the order sheet sent to them for items the company never received. Van Tonder said the items on the order sheet were “all non-VAT items”. He said the payments to Equal Trade were always done before the invoices were generated. Van Tonder said Equal Trade would receive a fake order which Bosasa would pay for and in return receive cash minus a 12% commission. The fake invoices, he said, were created to make the operation seem legitimate.